What was the hottest ticket last month in Provo? 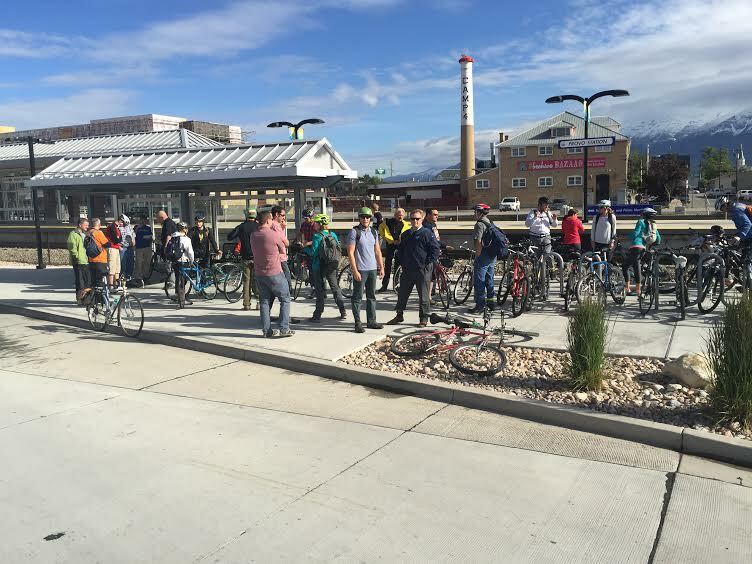 It may have been the Mobile Active Transportation Tour (MATT), an introduction of Provo’s active transportation routes for city elected officials, transportation and planning administrator, and bicycle advocates. Though attendance was capped at 40 participants, over 50 riders from up and down the Wasatch Front joined the tour on May 20th, one of five MATTs this year held in the state which are coordinated by Bike Utah, Mountainland Association of Governments, the National Park Service, UTA, and the Wasatch Front Regional Council. On a beautiful morning on one of the few days it did not rain in May, participants arrived by train at the Provo Frontrunner Station where they were greeted by Gary McGinn, Provo’s director of Community Development who under the mayor’s direction is coordinating the implementation of the Provo Bicycle Master Plan. Due to the many participants, cyclists broke into two groups for the ride. On Center Street, Bill Peperone told the group about the tremendous transformation of the downtown and how the city is working to make it more bicycle and pedestrian friendly. On 200 East, engineer Brad Jorgensen talked about plans for the street to become a Neighborhood Greenway and the groups saw 16 sharrow (shared lane) signs that neighborhood activists had painted on the street earlier that week in preparation for the Complete the Street 200 East block party. One city engineer from the Salt Lake Valley remarked that he loved such community involvement and interest in making streets complete. At BYU, the group learned from Bob Ross about the administration’s ongoing efforts to make campus more accommodating and safer for bicyclists and pedestrians. MAG’s Jim Price showed them the College Connector Trail, and Doug Robins of Parks met the group on the Provo River Trail as the traveled parallel to University Avenue and reported that Parks would intends to upgrade that trail to the “Murdoch Canal-standard.” That was a nice segue to the transition to that trail as the group entered Orem, and concluded the ride at MAG’s office on 800 North where they participated in an Active Transportation committee meeting. The tour highlighted Provo’s completion of, plans for, and process of integrating biking and walking with transit (most importantly BRT), housing, shopping, employment, and recreation destinations. Thanks to Provo City and BYU (and Outdoors Unlimited which provided a few bikes for participants who were not able to bring one along), which were assisted by the Provo Bicycle Committee in hosting the event. This entry was posted in Bikes in the News, Complete Streets, Provo Bicycle Plan, Provo Bicycle Projects by Jamie. Bookmark the permalink.